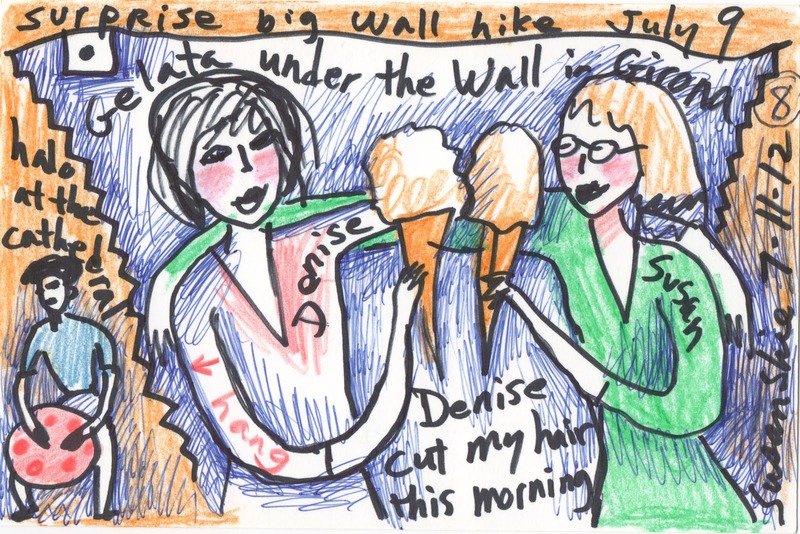 Diary of artist Susan Shie. 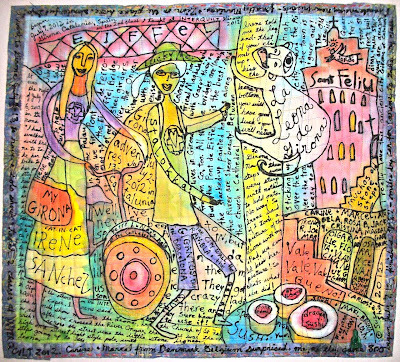 Outsider artist with an MFA, painter, writer, social commentator. 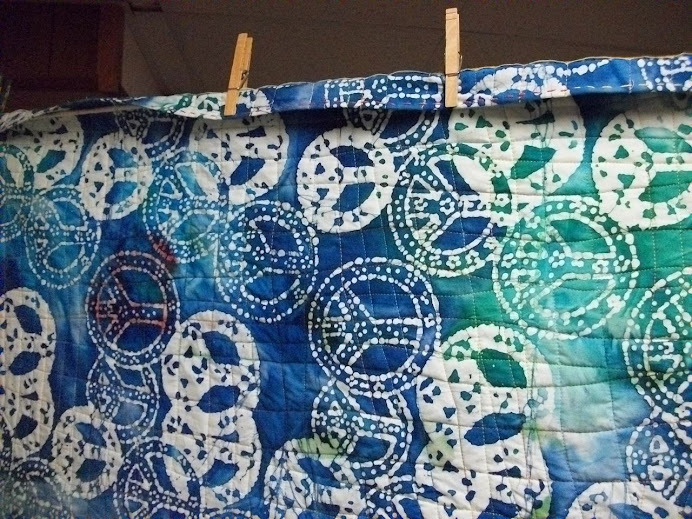 Art Quilts of my life and others' and world events. Politics, my Kitchen Tarot, astrology, healing the Earth, family and friends. Visit my site www.turtlemoon.com. Study with me at my home studio or away. 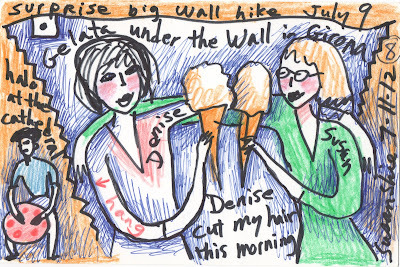 See my pre-blog Turtle Trax Diary from August, 1997 to July, 2007, at http://www.turtlemoon.com/trax/diary1.htm. 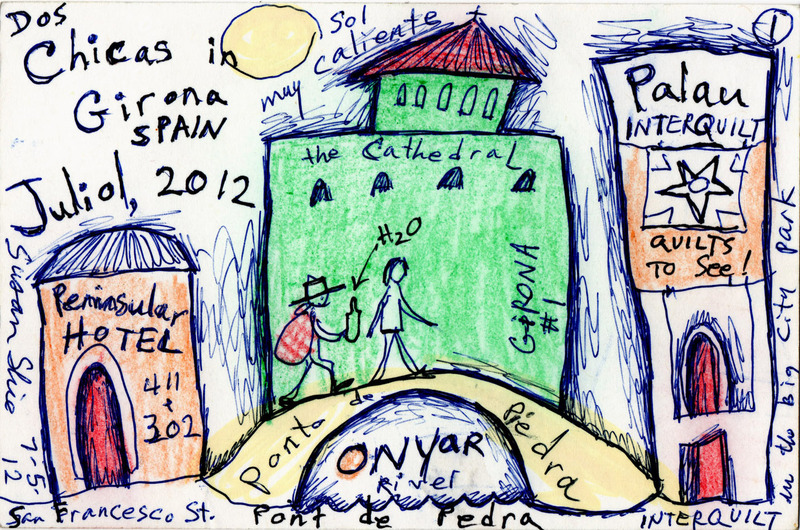 Here are the nine little drawings I made when I was in Girona, Spain, in July. 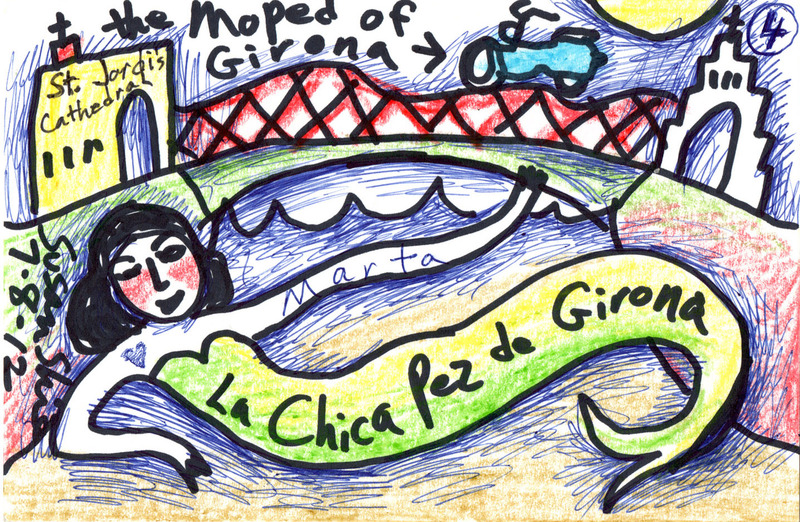 I kept meaning to scan and put them here, but got all caught up in making the big art quilt about Girona, which is now done. It's called "Dragon Sushi: 9 of Pyrex Cups in the Kitchen Tarot," and you can read my big statement about it in my website's 2012 gallery. But there are no pictures of it there, as I can't risk showing any, in case they migrate to somewhere else on the internet and wreck my chances of having this work be accepted for Quilt National '13. It is their rule, and I can't see any way to control keeping my images only on my site, so I'm just not putting any up til it's safe. 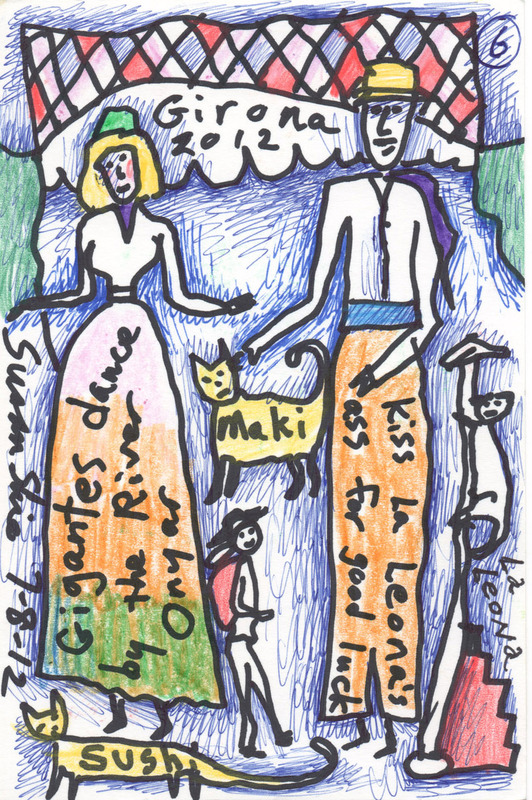 I think that's what has made me so restless to get something else up about Spain, and thus now it's time to finally show these little 4 x 6" ink, crayon, and colored pencil drawings on paper. 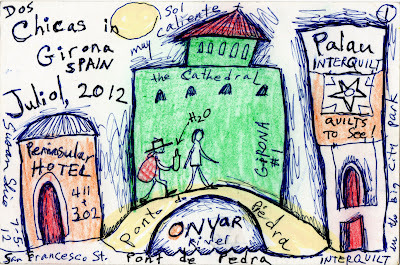 We got to Spain on July 3, but I didn't get around to drawing much til July 5. So I went back and worked on my first impression: Denise and me walking from the Peninsular Hotel to the Palau, across town, starting with walking over the Pont de Pedra, the Stone Bridge. I threw in the Cathedral, since that had made a huge impression on me right away! You can see it from everywhere in that part of the city. 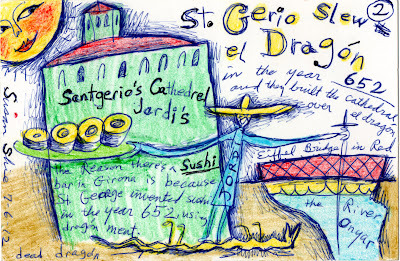 On July 6 I made up my story of how the Cathedral came to be there and why there's a Sushi Bar in Girona. 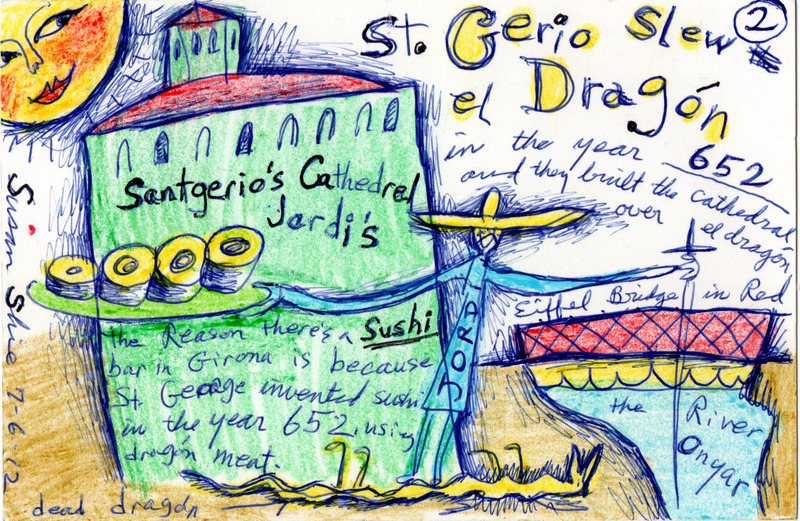 Having slewn the dragon, St Jordi then invented Sushi, had the Cathedral built on the spot where the slaying happened, and then they put the Sushi Bar across the river, where you can sit and eat sushi and admire the Cathedral. The Eiffel Bridge is really a bit downstream from the Sushi Bar, but I wanted to show it, because it's my favorite bridge. anywhere! There were Spanish and I guess Catalan lessons going on for us with the girls from Girona Quilt Art, and Olga told me to say VALE instead of Bueno. Marta explained that "vale" actually has three meanings: that something is a bargain, the actual object for bargains: the coupon, and the expression of "Vale! Vale!" or "Vale! Vale! Vale!" which means "cool." Or "OK." Or "Good." I just now realize that I forgot to write "Vale! Vale! Vale!" 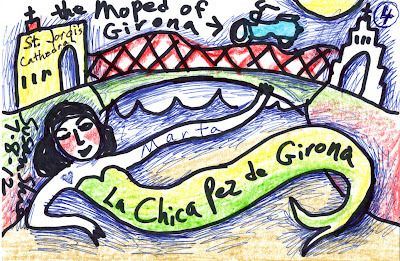 somewhere on the big piece, like where Olga is, or where the group of Girona Quilt Art women are. What can be done? ratz! 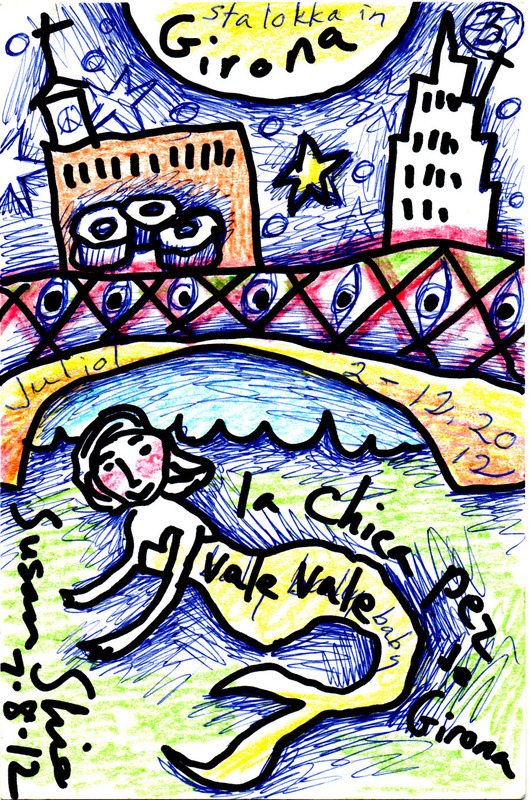 I made the Fish Chick of Girona to be the water goddess there. I think it's really Marta, who lives with Vlady in one of those lovely tall houses squished together right on the riverfront. In my second version of the Fish Chick, I gave her an aqua colored Moped, since she'd be that cool, and there are so many Moped riding women in Girona. And I took a little license and put the Cathedral across the Eiffel Bridge from the church of St Feliu. That is so silly, really, but it looks nice for balance here. Vale! 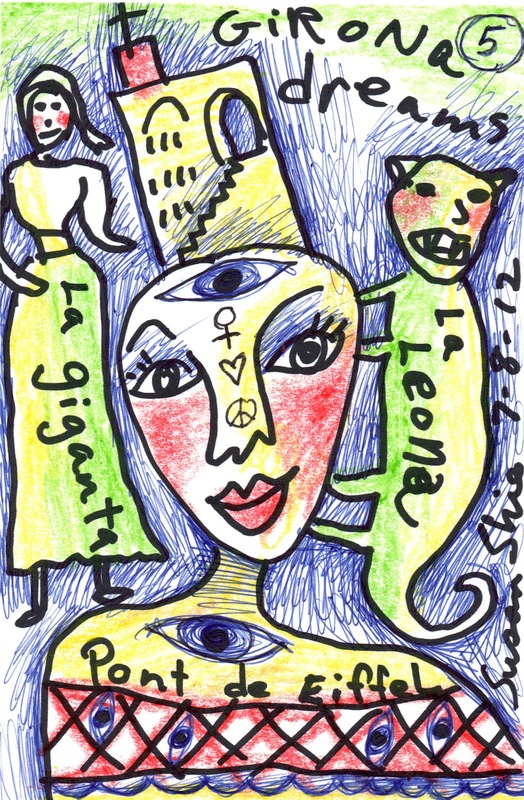 Here I combined the girl Giganto with La Leona, who is very close to the church of St Feliu. I stuck in the Pont de Eiffel again, because I love it so much, and you'll see it again, right away in the next piece, too! 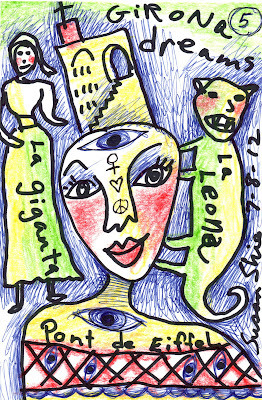 This drawing is just about all the images I love best in Girona! Denise cut my hair on July 11, but after I numbered these, I realized this was really #8, not #7. So it's a flaw, but that's how it's staying. I numbered them with ink, so forget it. Olga gave me the Spanish word "Peluquera" for hair dresser. And a beauty parlor is a peluqueria. Our hair chopping episodes took place in Girona Quilt Art though, and after my cliff, Olga got hers really, really cut short by Denise and Marta. Butch cut. It looks great, too! This adventure is from July 9, but I drew it on the 11th. Denise had been up to the Cathedral and the Old City Wall last year, but this was my first trip to Girona. So she took me on July 9. We met some really cool people, but the coolest was Perro Lunar, the guy really named Marc Pao, who was playing a hang drum in a little stone alcove of the Cathedral's outer wall. We had never heard one of these before, so I got really ambitious and made a little video, the only one I made in Spain. Then we walked up a lot more stone steps, even though we'd walked up tons of them just to get to the Cathedral. In the hot sun, we walked on that ancient wall, and the view was stunning, looking down on the city and the river. Later we cooled off with gelato, a home remedy for heat exhaustion we indulged in about 4 times during my stay there. It works! 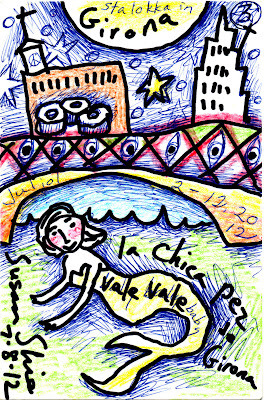 I didn't make a drawing about our trip to Barcelona on July 10 on the train, which was an adventure we had with Carine and Marcel from Belgium. 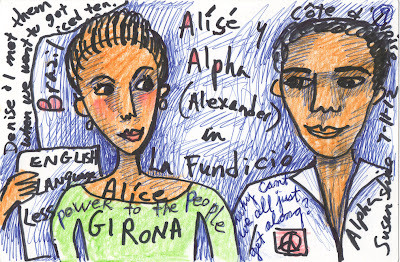 But the last day, we met Alise and Alpha. She's from Brazil and he's from Cote d'Ivoire, and there we were in her little wine store and restaurant, discussing world politics and peace with them in Spain. 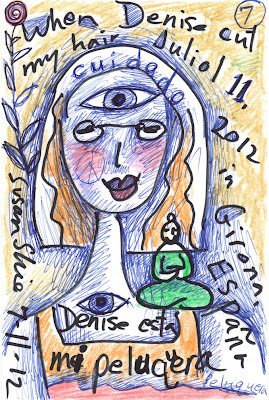 It was a very magical experience, as were most of the things that happened in Girona. I wish I could show you the art quilt, coz it's full of stories and images of all the new friends I have there now. I have tons of pictures, actual photographs, of my trip to Girona, on my Facebook page, so go see them, if you haven't already. Spain part 1 and Spain part 2 are albums I've given links for here, that will work even if you're not on Facebook. The first quilted piece I made about Girona is called "La Leona" and is a small piece that I started in the second class I taught at INTERQUILT 2012 in July. I have a Facebook album about it that you can access, even if you're not on Facebook, so you can see a bunch of in-progress and detail shots and a photo of the actual Leona statue. 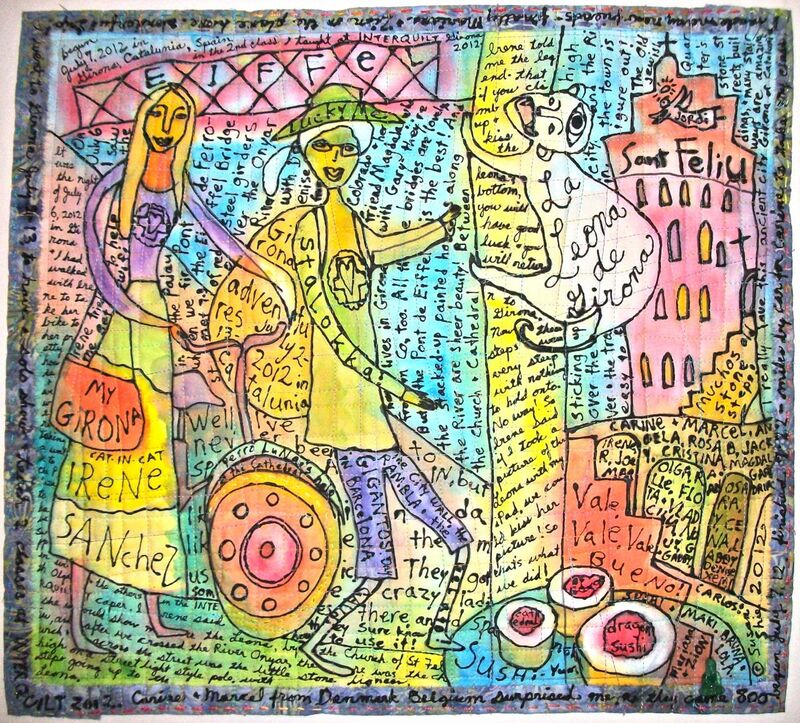 This piece is 19.25"h x 21.5"w, and is mainly about when Irene showed me the Leona in the first place, on a lovely evening walk in Girona. How can I follow by email?